A life-size, skeletal robot with a masculine voice greets visitors as they enter the “Robot Revolution” exhibit at the Museum of Science and Industry. “For now, you humans can do these things much better than I can,” RoboThespian says. Curator Kathleen McCarthy, who traveled the globe to select the robots for the show, says that one of its primary goals is to highlight the distinctions between humans and our artificial counterparts. This type of technology, McCarthy says, is “definitely going to change how we live our lives.” She says she wants visitors to consider how robots and humans relate to one another. “That’s where we figure out how best we work together,” she said. The exhibit, which premiered at the MSI in 2015 before moving on to the Denver Museum of Nature and Science and the Franklin Institute in Philadelphia, provides a window into the industry, showcasing robots built for military and police use, surgical purposes, factory output, therapy and … pure entertainment. There’s EMYs, which uses a facial action coding system to mimic facial expressions of passersby; LiDAR sensors that are used in self-driving cars; RiSE, able to crawl its way up brick and stucco walls, and 40 others. Some of them, like RoboThespian, are new to the exhibition. During a visit on opening day, visitors of all ages played blackjack with a FANUC robot that assumed the role of dealer, made Robotis-Mini dance through the use of a controller, and cheered when their Soccer Robots team scored. Opportunities like this – to interact with cutting-edge robots – don’t come often. And the bots on display here aren’t expected to make their way into daily use for some time. “For now, it’s driven by cost,” said Curtis Layton, co-founder of Hebi Robotics. His company created the six-legged bot Daisy, whose ability to navigate rough terrain makes it useful for search-and-rescue missions. Layton said the high cost of the materials used to make these robots means they’re not yet affordable to the general public. Illinois Institute of Technology professor Matthew Spenko, whose drone HyTAQ Quadcopter is on display at the exhibit, said safety concerns are also barriers to more mainstream use. “The robotics community and researchers need to work with government regulating agencies to come up with methodologies to ensure safety,” Spenko said. Meanwhile, the MSI hopes to educate the public so that when robots become more readily available, society will be ready. “It’s really important for guests to have the opportunity to see what these robots are so that we’re better prepared for the conversations we need to have as a society about how we embrace this technology,” McCarthy said. “Robot Revolution” is on display at the Museum of Science and Industry through Feb. 4, 2018. April 5: They’re fast, they’re precise and in some cases they’re even ... cute. 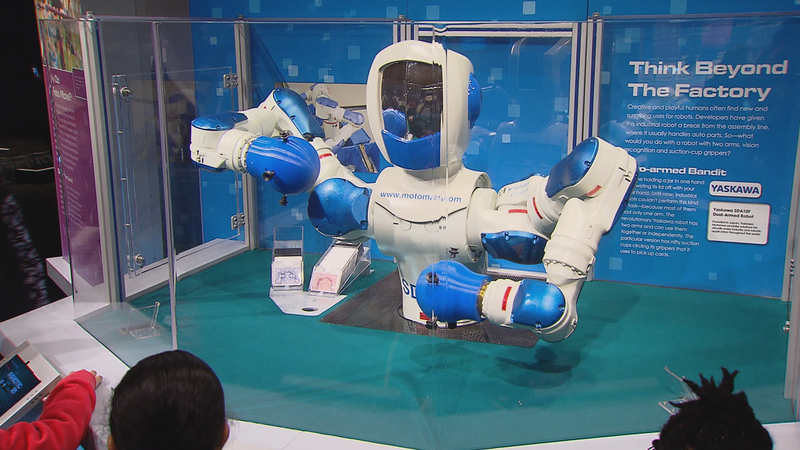 We visit the trade show Automate to get a look at the latest in robotics. Oct. 18, 2016: A paralyzed man is able to experience the sense of touch through the use of a robotic arm controlled by his brain. The breakthrough was made possible, in part, by years of research by a University of Chicago professor. May 21, 2015: The Museum of Science and Industry premieres a new national touring exhibit that explores how robots, created by human ingenuity, will ultimately be our companions and colleagues, changing how we play, live, and work together.